Would you prefer a really comfortable black nursing bra? If so then we can recommend the Bravado Body Silk Seamless nursing bra. It should also give you a really nice shape too thanks to the moulded foam cups. 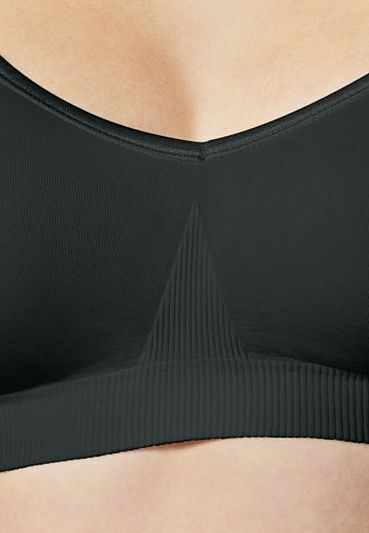 We think you may also really love the buttery-soft fabric...this helps the bra to "melt" onto your body. 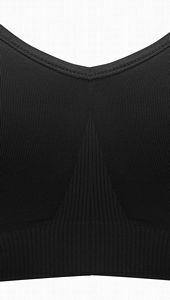 It is also virtually invisible under clothing. Health professionals tend to suggest that if possible, you should avoid underwires during your nursing months. So you may be pleased to know that this bra is wirefree. 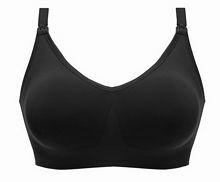 If you have not yet given birth, then this bra may be a good choice, as it is also suitable as a pre-natal bra. Not sure what size nursing bra to pick? If so, then this bra helps makes life a little easier for you. It comes in only 5 sizes. Rather than picking, for example, a 36F, you would pick from either Small, Medium, Large, Extra-Large or Extra-Extra Large. Have a look at the table below to find out which size should be best for you. This bra is also available in more colours. Ivory, Butterscotch, Latte, Pink Ice, White Blush and Silver Belle can be seen on our Bravado section of this web site. So what makes this nursing bra such a good choice? Well, we think you will find it exceptionally comfortable, and it should be easy for you to pick the right size. It is one of our most popular nursing bras.